Top EU official says extension is probable, after British PM Theresa May confirms she is considering extending transition period beyond end of 2020. European Commission President Jean-Claude Juncker said Thursday that the Brexit transition period would "probably" be extended to try to break the deadlock on Britain's divorce talks. "This prolongation of the transition period probably will happen. That's a good idea," said Juncker, after British Prime Minister Theresa May confirmed she is considering extending the transition period beyond the end of 2020. Under current proposals, Britain will remain inside EU rules from the time it leaves the bloc in March until December 2020, to give time for new trade relations to be set up. But with Brexit talks at an impasse, the bloc has suggested extending that period, to give more time to strike a trade deal that ensures the border between Northern Ireland and the Republic of Ireland remains friction-free — the main sticking point to a Brexit deal. Divorce talks between Britain and the bloc have stalled on the issue of the Irish border, which will be the UK's only land frontier with the EU after Brexit. Britain has proposed instead that all of the UK could stay in a customs union, but only temporarily. The EU insists there can be no time limit. May urged both parties to show "courage, trust and leadership," but eventually failed to bring new concrete initiatives to the table while addressing fellow leader of European Union countries. 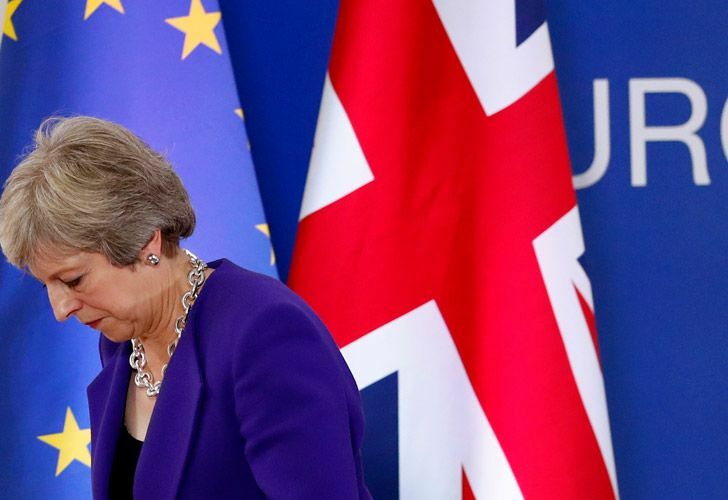 The worry is Britain could crash out without a pact on future relations with the EU or without even a transition period to ease its exit — what has become known as a "hard Brexit." Tariffs would be placed on exports, border checks would be reinstalled, and restrictions could hit travellers and workers. Some are warning of shortages in markets like medicines and even sperm donations. The European Union's chief Brexit negotiator Michel Barnier said the EU and the British government need "much more time" to reach a divorce agreement. The next official EU summit is scheduled for December, just over 3 and half months before Britain ceases to be an EU member. Any deal that is struck needs time to be approved by the British and European Parliaments. But "it must always be clear that, although we want to avoid hardship, ultimately the difference between membership in the European Union and a partnership with the European Union as a third state must and will become clear," said German Chancellor Angela Merkel. Reaching agreement with the bloc is only part of May’s problem. The British leader will have to get any deal past her Conservative Party — split between "hard" and "soft" Brexit factions — and past her parliamentary allies in Northern Ireland's Democratic Unionist Party, who insist a solution can't include customs checks between Northern Ireland and the rest of the UK. The extension proposal angered pro-Brexit UK politicians, who saw it as an attempt to bind Britain to the bloc indefinitely. In an open letter Thursday to May, leading Brexiteers accused the EU of "bullying" and said the border issue was being used as "a trap" by the bloc. The letter signed by former British foreign secretary Boris Johnson, ex-Brexit secretary David Davis and other pro-Brexit Conservatives warned May not to "engage in a show of resistance and a choreographed argument followed by surrender" to the EU. Pro-EU politicians, meanwhile, said the proposal was another sign of May's weak bargaining hand and an attempt to stall for time. Liberal Democrat lawmaker Tom Brake said May was merely "kicking the can further down the road." According to the International Monetary Fund, UK growth this year is expected to be a muted 1.4 percent. But after Wednesday's summit, the risk is it could be even lower if firms become more cautious. "Business' patience was already threadbare and is nearing an end," said Carolyn Fairbairn, director-general of the Confederation of British Industry, a lobby group that represents mainly big firms. British businesses are particularly open to foreign markets, investing heavily abroad, hiring foreigners and exporting to other markets, particularly the EU, the biggest destination for British goods.